Atlas Foundation of Atlanta proudly provides foundation repair services for the Greenville area. The city qualifies as a part of the humid subtropical climate zone because it experiences a change in seasons throughout the year. Winters bring temperatures into the thirties while summer highs average in the nineties. About 46 inches of rain fall every year in Greenville, a lot more than the national average of 36.5 inches. The rain not only brings some gloomy days to Greenville, it can also bring about some potential issues for your commercial business’ foundations in the area. The professionals at Atlas Piers of Atlanta can handle all of your commercial foundation repair needs. When precipitation falls, the ground becomes saturated. If a lot of rain falls in a relatively short amount of time, the ground can become overly saturated. This puts what is called hydrostatic pressure on your commercial businness’ foundation. A foundation is built to withstand a certain load of pressure, but if that amount is surpassed, your foundation may begin to crack. Water, insects, and even critters can seep and sneak in through these cracks and cause trouble in your business. Don’t let this be true of your business. Call us to help you avoid this situation. We are your foundation repair Greenville North Carolina experts! A change in temperatures can be dangerous too. As temperatures vary, the soil beneath your business expands and compacts, thus weakening it. Because the soil loses its original strength that your business was built on, it can cause what is called foundation settlement. You’ll notice things like sticking doors and windows, sloping floors, cracking walls and floors. If this is true of your business, contact us as soon as you can! The sooner we can get started fixing the problem, the sooner we can make your business safe again! Fortunately, Atlas Piers offers a wide variety of foundation repair solutions to fit your every need. One of the most demanded services is underpinning. This is a process in which a foundation pier is driven deep into the ground underneath a foundation and into stable soil. Next, the weight of the structure is transferred onto the pier and the structure is lifted and stabilized. It is usually used to repair sinking or settling foundations. We offer several types of foundation piers: helical piers, steel push piers, slab piers, micropiles, and new construction piers. 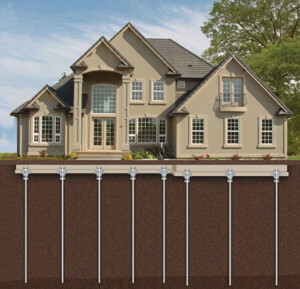 If a void develops beneath your foundation, we will use our pressure grouting technique to fill the void and stabilize your foundation. In this technique, a grout is injected beneath the foundation to fill the void and give the foundation the support that it needs. Maybe you have a foundation wall that is leaning or bowing, we can install a helical tieback to straighten it. These work by anchoring into the soil outside and applying a horizontal pressure on the wall opposite to the direction of the lean. Carbon fiber strips can also be used to repair basement walls, as they provide support and strength to lock the wall in place and seal cracks. In addition to all of these services, we also offer encapsulation for basements or crawlspaces to seal out moisture. We are here for all of your foundation repair Greenville North Carolina needs! Give us a ring to help with your next project or problem! Contact Us for more information.